It is well recognised that over the past three to four decades the incidence of asymptomatic primary hyperparathyroidism has increased significantly. However, more recently this pattern has further evolved into a presentation with normocalcaemia and raised parathyroid hormone (PTH) level without the presence of a recognised stimulus for its rise, in the form of vitamin D deficiency or renal impairment. A diagnostic label of normocalcaemic hyperparathyroidism (NPHPT) has been given to this phenotype and in most such individuals, the initial PTH measurement is driven by the presence of metabolic bone disease. The reported prevalence, degree of end-organ involvement and the rate of progression vary considerably and are related to patients studied and the biochemical cut-offs used in its definition. A majority of patients are diagnosed during assessment of metabolic bone disease of varying degrees. Once the diagnosis is confirmed by excluding confounding factors, the patient should undergo full assessment of end-organ involvement, which is the main determinant of further therapeutic decisions. Surgery, with prior localisation, is considered in patients with significant end-organ involvement in keeping with the guidance for hypercalcaemic patients. If a patient does not meet these criteria, annual clinical and biochemical surveillance is recommended to identify progression to hypercalcaemia or worsening end-organ involvement. It is less clear if patients identified during ‘routine’ requests for evaluation of unrelated symptoms require similar close monitoring. In conclusion, in this review on NPHPT we focus on its definition, planning of further investigations, selection of patients for intervention and devising an appropriate follow-up strategy. Over the past four to five decades, since the advent of multichannel autoanalysers, in a vast majority of patients, primary hyperparathyroidism has been diagnosed as a serendipitously discovered asymptomatic condition, when serum calcium is measured for unrelated reasons. It is now one of the most common endocrine disorders and between 1995 and 2010 its prevalence rose from 76 to 233 per 1 00 000 women.1 Despite its incidental discovery, bone mass is typically reduced at the distal one-third of radius, a site that is enriched in cortical bone.2 Diagnostic workup and management strategy of this asymptomatic cohort has been the subject of four international workshops and is now better understood. More recently, a newer clinical presentation of primary hyperparathyroidism has aroused considerable interest. It has been given the label of normocalcaemic primary hyperparathyroidism (NPHPT) and was initially described by Wills et al as a variant of primary hyperparathyroidism.3 Patients have normal concentration of total and ionised serum calcium with raised level of parathyroid hormone (PTH). In most such individuals, the initial PTH measurement is driven by the presence of metabolic bone disease or renal stones, which allows the identification of what is believed to be a previously unrecognised stage of the condition. Since its formal recognition in 2008, during the third international workshop on asymptomatic primary hyperparathyroidism,4 several studies have been published although there is a lack of uniformity in patient selection and cut-off values used to define the condition. 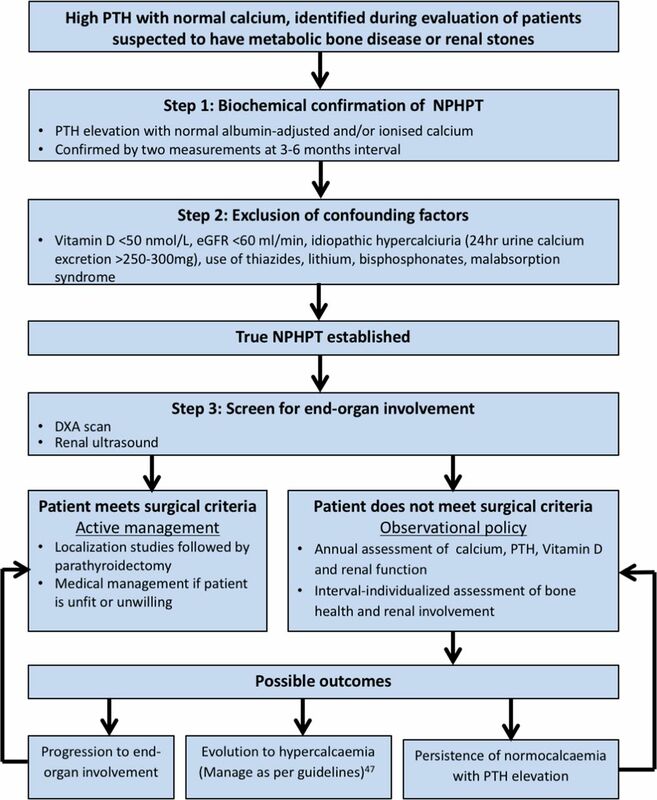 Maruani et al explored another explanation by comparing patients with NPHPT and HPHPT for renal calcium and phosphate handling and bone turnover makers. Patients with NPHPT had lower fasting urine calcium excretion and tubular reabsorption, higher value of renal phosphate threshold and lower values of markers of bone turnover. Based on these findings they proposed that in patients with NPHPT, maintenance of normocalcaemia is a manifestation of resistance of renal tubules and the skeleton to the effects of PTH, possibly linked to the protective impact of oestrogen.10 However, the progression of NPHPT to HPHPT and its diagnosis during postmenopausal age group do not support this hypothesis. Their findings have not been reproduced and the concept of biphasic onset is now widely accepted. The data on the epidemiology and natural history of NPHPT is limited and conflicting and this has hindered formal recommendations to be made on its work-up and management. Although no formal age and gender distribution data is available, NPHPT is more commonly seen in women of postmenopausal age group, as is HPHPT.5 11 12 A wide range of prevalence figures and rates of progression are reported due to variations in the criteria used to exclude secondary hyperparathyroidism and in the selection of the study population as summarised in table 1. However, the true prevalence of NPHPT is best assessed by studies undertaken on unselected cohorts which report a lower prevalence and rate of progression.14–18 A Swedish study on 608 individuals from a non-referral population reported a prevalence of 2% in 1995 which increased to 11% in 2007, with vitamin D deficiency and renal impairment appropriately excluded. After 13 years of follow-up only one patient progressed to hypercalcaemia and none had adverse bone, renal or cardiovascular outcomes. The authors suggest that the seemingly high prevalence at the time of the follow-up assessment may be secondary to confounding factors like increasing age, body mass index or changing vitamin D level irrespective of its absolute value.14 A recent review of two unselected community-dwelling cohorts from the USA by Cusano et al (The Osteoporotic Fractures in Men, MrOS and Dallas Heart Study, DHS) reported an even lower prevalence figures of 0.4% and 3.1%, respectively.17 A prevalence of 16.7% was reported in a Canadian-based study of 1871 subjects from general population (CaMos), although vitamin D deficiency was not excluded.19 The above studies also highlight a disparity in the reported prevalence of NPHPT from Canada, USA and Europe. On the basis of these studies on such varied patient groups, we can conclude that the prevalence of NPHPT in general population is low when strict criteria are used to exclude secondary hyperparathyroidism and other confounding influences. By contrast, when NPHPT is identified during assessment of patients with metabolic bone disease or renal stones, the rate of progression is high in untreated patients, indicating the need to assess such individuals for progressive rise in serum calcium and/or end-organ involvement during the initial evaluation and follow-up. There are no formal recommendations on how to investigate, manage and follow the patients identified with NPHPT. On the basis of our greater understanding over the past decade, the following three-step pragmatic approach is proposed for evaluation of NPHPT and is depicted diagrammatically in figure 1. Proposed management plan for patients with NPHPT. DXA, dual-energy x-ray absorptiometry, NPHPT, normocalcaemic primary hyperparathyroidism; PTH, parathyroid hormone. Biochemical diagnosis of NPHPT consists of demonstration of persistent normocalcaemia using serial ionised calcium or serum albumin-adjusted total calcium in the presence of an elevated PTH.5 6 Persistence of normocalcaemia distinguishes NPHPT from HPHPT where calcium can be intermittently elevated.20 One could hypothesise that the phase of intermittent hypercalcaemia may represent a transition stage between patients with normocalcaemia and hypercalcaemia. The Proceedings of the Fourth International Workshop on the diagnosis of asymptomatic PHPT recommended that ionised calcium should be in the normal range.7 It represents the biologically active free fraction of calcium21 and remains the gold-standard measurement. It has specific benefits in the context of NPHPT where the albumin-adjusted value has been found to be misleadingly normal in patients with high-ionised calcium.22 23 Adjusted calcium can also be unreliable in low-albumin states.23 Maruani et al 10 and Wade et al 24 demonstrated significant discordance between ionised and total calcium and recommended the use of the former. However, point-of-care (POC) testing with blood gas analyzers used to obtain ionised calcium level is not widely available in an outpatient setting and its use is hindered by other barriers such as precision, standardisation, special sample management and high cost.22 25 In view of these constraints and in keeping with its use in multiple other studies,6 8 13 14 serum albumin-adjusted total calcium continues to be measured and reported in many UK centres.26 However, we would certainly recommend confirmation of normocalcaemia with ionised calcium estimation if the albumin-adjusted value remains close to the upper limit of reference range and in patients with low albumin. The other major confounding factor to consider is renal failure, which is a well-known cause of secondary and tertiary hyperparathyroidism. There is an inverse relationship between PTH and glomerular filtration rate (GFR) as demonstrated by Martínez Diaz-Guerra et al.20 PTH has been shown to rise with a fall in estimated GFR to <60 mL/min in large population surveys and a value of >60 mL/min would support the diagnosis of NPHPT despite the difficulty in ascertaining the cut-off in individual patients.7 20 Some studies have used an exclusion criterion of <40 mL/min,5 6 21 but this seems too generous. Once a patient is identified as having NPHPT, the next step is to determine if they have end-organ involvement, as is the case with asymptomatic HPHPT. One would expect NPHPT to be a mild condition but this is not necessarily the case. Several reports indicate that the prevalence of bone and renal involvement is either higher or similar to patients with hypercalcaemia.6 11 21 36 In patients with established bone or renal involvement at the time of the diagnosis, assessment should focus on the likely impact of NPHPT on disease progression. There is a lack of clarity about the pattern of bone involvement in patients with NPHPT. Lowe et al reported osteoporosis in NPHPT to commonly involve the lumbar spine (34%) and hip (38%), with no preferential bone loss at the distal one-third of radius6 unlike in patients with HPHPT.5 Marques et al, however, demonstrated similar level (28.5%) of osteoporosis at lumbar spine and distal radius.21 Charopoulos et al used high-resolution peripheral quantitative CT in 52 postmenopausal women with primary hyperparathyroidism. The bone mineral content and volumetric bone mineral density were reduced at cortical as well as cancellous sites in both NPHPT and HPHPT groups but the latter group demonstrated a greater reduction.39 Although catabolic effects on bone are present in all patients with primary hyperparathyroidism, markers of bone turnover and net bone calcium release are lower in the normocalcaemic group.10 This supports the end-organ tissue PTH resistance hypothesis proposed by Maruani et al 10 but could also be explained by the relatively lower PTH level in patients with NPHPT. The impact of NPHPT on the kidneys appears to be similar to that of patients with HPHPT, namely nephrolithiasis and nephrocalcinosis, with a wide variance in the reported figures for its prevalence. A retrospective analysis reported a similar prevalence of nephrolithiasis in NPHPT (18.2%) and HPHPT (18.9%).36 Maruani et al 10 noted a prevalence as high as 35% and in other studies it has ranged from 4% to 28.6%.6 11 21 The presence of hypercalciuria in patients with HPHPT has been reported to be around 40%.40 A similar but milder increase in 24-hour urinary calcium excretion has been observed in patients with NPHPT with the proposed mechanism being a relatively lower calcium reabsorption rate.10 However, there are no reports of its prevalence or its correlation with renal calculi formation. As in patients with HPHPT, it is not known why some patients with NPHPT form stones and in both these groups of patients the degree of calcium excretion is not a strong single predictor of calculi formation. There is also no evidence on the likelihood of progression of renal involvement with time or on the impact of parathyroid surgery. The link between cardiovascular disease and primary hyperparathyroidism remains contentious. An epidemiological study from Rochester (USA) reported a lower than expected cardiovascular mortality in these patients.41 However, the Parathyroid Epidemiology and Audit Research Study (PEARS)42 as well as several Scandinavian studies43 have shown an increase in all-cause mortality, fatal and non-fatal cardiovascular events in patients with primary hyperparathyroidism. A number of risk factors and surrogate end-points have been proposed as mechanisms including hypertension, dyslipidaemia, insulin resistance, endothelial dysfunction and left ventricular hypertrophy. However, as there is no prospective data on cardiovascular outcomes in patients with NPHPT,47 further investigations to evaluate cardiovascular risk do not form part of the workup for patients identified with NPHPT and nor is parathyroid surgery recommended with a view to improving cardiovascular endpoints. In the absence of sufficient data on its natural history, it is challenging for a clinician to formulate a management plan for an individual patient with a confirmed diagnosis of NPHPT. Patients in whom the degree of bone or renal involvement is not significant enough to consider surgery, a structured observational policy can be adopted. This consists of annual monitoring of albumin-adjusted or ionised calcium, PTH, vitamin D and renal function.5 47 Reassessment of bone density and nephrolithiasis at 3–5 year intervals has been recommended,26 although it may be more practical to adopt an individualised approach guided by the baseline measurements and overall risk profile for progressive bone disease. A 3-yearly reassessment to examine the sequential change in the bone density would certainly be recommended for patients with osteopaenia (T score between −1.0 and −2.5), those with multiple risk factors for osteoporosis or those with a high FRAX score at baseline. There is no clear guidance on the need for monitoring of urinary calcium in NPHPT and we do not recommend this, as the degree of hypercalciuria is mild10 and is not likely to help in predicting nephrolithiasis. During this period, we suggest maintaining vitamin D level to >50 nmol/L (and ideally >75 nmol/L).7 Occasionally, PTH may normalise and the patient would no longer fulfil the criteria for NPHPT. On the other hand, patients who demonstrate progression to hypercalcaemia or new onset of bone or renal complications would merit assessment for surgery as above. It would also be of significant clinical advantage to be able to precisely recognise the relationship between changes in vitamin D and PTH levels. Greater understanding of the impact of relative changes in vitamin D level on PTH, rather than its absolute value, impact of factors such as age, ethnicity and calcium intake on this relationship and the time to normalisation of PTH after vitamin D level reaches a predefined target would be helpful. Standardisation of PTH assays and information of vitamin D dynamics may help us to explain an isolated rise in PTH in a significant number of patients which in turn would allow us to focus on the subgroup of patients with a potentially progressive condition with future adverse impact on patient morbidity. NPHPT is not a new entity and following its formal recognition almost a decade ago, more experience has accumulated on the diagnosis and management of this distinct endocrine condition. In clinical practice, patients are diagnosed with NPHPT either incidentally during investigation of an unrelated condition or during the assessment of patients with bone and renal involvement. There is clear evidence of significant variability in the likelihood of clinical and biochemical progression of patients with NPHPT, and this in turn makes it difficult for clinicians to make decisions on how to investigate and manage this diverse condition. In this review we have suggested a simple three-step pragmatic approach to a patient suspected to have NPHPT, which involves confirmation of the diagnosis, exclusion of confounding factors and finally assessment of end-organ involvement, which is the main determinant of the management plan.
. Relative prevalence of normocalcemic and hypercalcemic hyperparathryoidism in a community-dwelling cohort. 33rd annual meeting of the American society of bone and mineral research. San Diego, CA, 2011. Abstract 0173.
. Association for clinical biochemistry and laboratory medicine. 2012 http://www.acb.org.uk/whatwedo/science/AMALC.aspx (accessed 1 Aug 2017).
. FRAX ® Fracture Risk Assessment Tool, 2016. https://www.sheffield.ac.uk/FRAX/index.aspx (accessed 1 Nov 2017).
. Survival after the diagnosis of hyperparathyroidism: a population-based study. Am J Med 1998;104:115–22.
. Parathyroid adenomas and glands in normocalcemic hyperparathyroidism - a light microscopic study. Am J Pathol 1976;83:475–82. National Institute for Biological Standards and Control, NIBSC. WHO International standard parathyroid hormone 1-84, human recombinant, NIBSC code 95/646, version 9.0. 2010. http://www.nibsc.org/documents/ifu/95-646.pdf (accessed 1 Aug 2017).
. Improving the comparability of parathyroid hormone measurements – a report from the IFCC working group for PTH. Biochimica Clinica 2013;37(Suppl):S431.